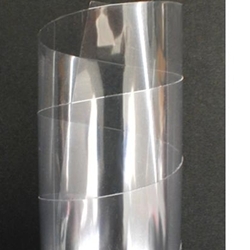 Clear Acetate Rolls...Perfect for overlays, stencils and protective coverings. Clear Duralar... Duralar is a clear lightweight polyester sheeting. It is neutral pH and ideal for protecting artwork. Polyester is much more flexible than acetate and a much better choice when protecting artwork, drawings or maps when folding and taping the plastic to the back of the work. This material is much more resistant to tearing than acetate.